It's a short AK receiver. Not a long Dragunov one. Magazine is typical .308 straight wall. The only short receiver Drag is the 6x49 one. Which was actually a Kalashnikov redesign. I know it's a Molot Vepr in .308. And I firmly believe the rifle we see is exactly that. The SVD-M still retains the long receiver. While the birdcage muzzle device and the gas port might indicate this is a Dragunov variant the typical short receiver tells me that this is a different thing. You mean it is a hybrid of Vepr and Dragunov designs? AFAIK Molot is not part of Kalashnikov Concern. The planned merger did not happen. So, it is odd that to see a new rifle from Concern Kalashnikov that has Molot origins. Maybe it is something completely new that happens to look like an SVD with short receiver. Hopefully the short receiver and straight magazine indicates 6x49mm calibre... it would be a very good cartridge out to about 1,200m in terms of ballistics. The small calibre long heavy projectile should get to the target faster than older slower heavier draggier rounds which would further improve performance, not to mention reduced recoil and lighter ammo. TheArmenian wrote: You mean it is a hybrid of Vepr and Dragunov designs? Possibly, we have seen them doing that with the 400 series. Where they've introduced the current gas port of the AK12 development and some of its features to a rifle that basically is a refined AKM. So Dragunov rework on a AK receiver? The barrel looks thinner than the current SVD-M, maybe they have another calibre for it...who knows. Just so you understand, why it is important about the rifle. Ok so gals and guys, we have two things here. 1. It's definitely a Dragunov system. 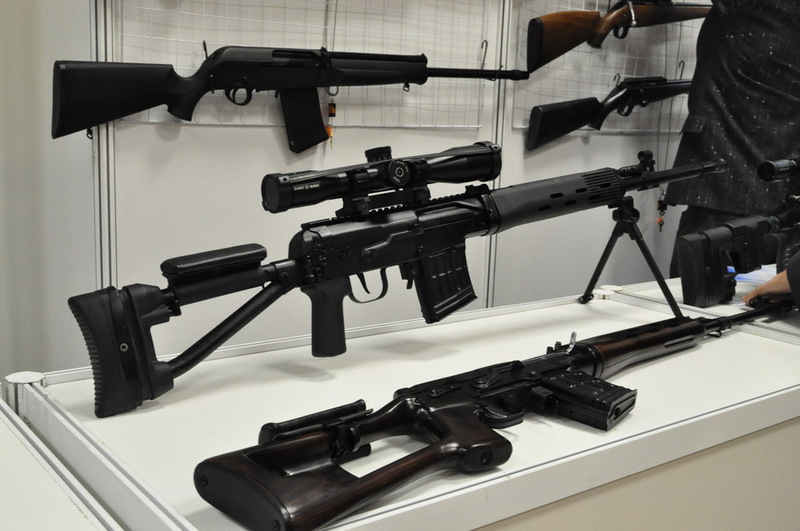 The receiver instead of the SVD one is actually based on the MA (Dragunov Carbine). 2. 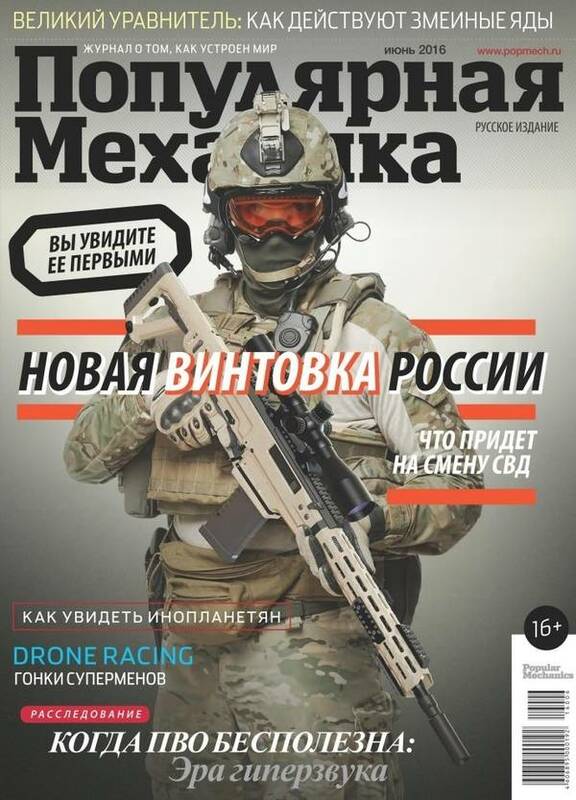 Popular Mechanics Russia has a piece about the SK-16, new Dragunov Rifle with Gas trap action...on .308/7.62 Nato. It's said to be the current version of the rifle we saw above. Compare with Dragunov MA and we can see the charging lever is Very similarly placed. Pause at 1:36. Look closely at the short stroke gas piston...The Sk16 screams MA in my opinion. How i hate this butstocks of M4 style. Ugly and flimsy. Werewolf wrote: How i hate this butstocks of M4 style. Ugly and flimsy. I agree It's not the most uplifting specimen. Well same goes for Serbian M21, yet when you take it in your hands it feels very solid and "unbreakable". M4 style buttstock? What do You mean? It doesn't look nothing like telescopic buttstock on any M4 variant. Looks solid too, thats what I would ecpect from Russian rifle. The issue is not the skeletonized stocks, but the fact they're polymer frames. In that regard Some of the worst offenders of late like Magpul's Zhukov are absolutely un-fit for service. KoTeMoRe wrote: The issue is not the skeletonized stocks, but the fact they're polymer frames. In that regard Some of the worst offenders of late like Magpul's Zhukov are absolutely un-fit for service. I'm offended that they named the buttstock 'Zhukov', like it had any chance to live up to the name. Look closely, get your own idea. Also...in Russian. It's basically the Copy Paste of the PopMech article. Rifle incorporates AN-94 derivated recoil principle. And a gas trap...however, there's a little issue with the bolt carrier which is a MA/SVD system. 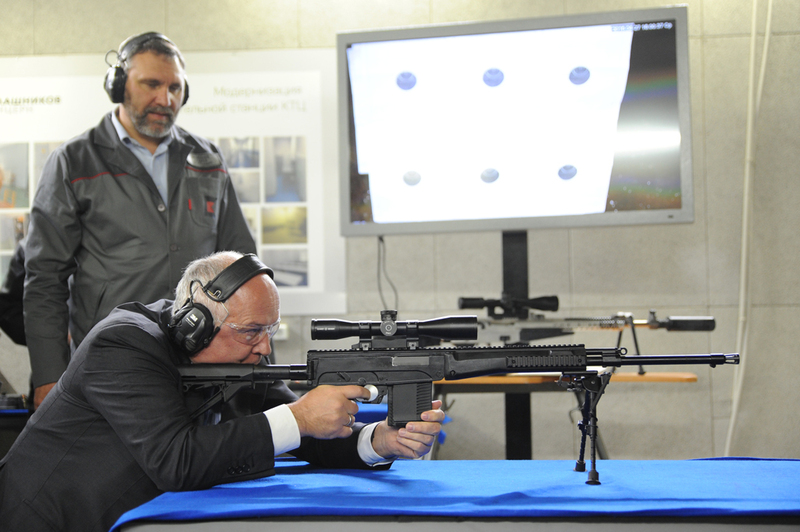 I see on world guns that the Russians have created a new calibre based on the 338LM sniper round. Their new round is larger calibre... it is a 9mm, but uses the same 69mm long cartridge case as the .338LM round and is intended for long range sniping. GarryB wrote: I see on world guns that the Russians have created a new calibre based on the 338LM sniper round. Their new round is larger calibre... it is a 9mm, but uses the same 69mm long cartridge case as the .338LM round and is intended for long range sniping. Yes the SR4. But it isn't exactly new...the gun has been in use for sometimes with Presidential security. David Fortier and I take a look at the SVD Dragunov sniper rifle. The SVD Dragunov is one of the most prolific sniper rifles on the modern battlefield. It has an interesting history behind it and I bet you learn a thing or two you didn't know about it in this video. I know I learned a few things in my conversation with David. The SVD in this video belongs to gun writer Marc Vorobiev who is also an Afghan war vet who served in the Soviet military during the 1980's. Thanks for that Austin... interesting. Otherwise very good... and BTW the German experts in optics they talk about that influenced the design of the optics... there was plenty of investment by the Soviet Union in German gun and optics technology, but most of that was destroyed by the German invasion of the country.... it is only fair German scientists were used to take up the slack... so to speak. So is this SK-16 being seriously considered? Or is this simply just something for the far future? sepheronx wrote: So is this SK-16 being seriously considered? Or is this simply just something for the far future? SK-16 is typical Halo product from Izhmash. They did a lot of those, just to put forward their know-how. there's literally nothing wrong with the SVD(S/M) what ever. 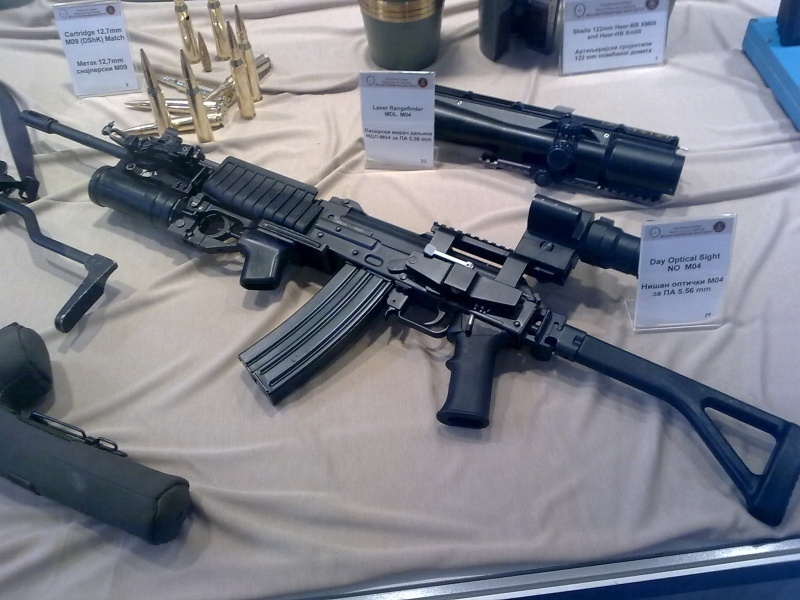 You could even dress the Dragunov System up like the SK without using a gas trap. Same deal was for AK400. It's just projects going on and off to steay active in R&D and maybe have foreign sales. The AK-400 should be a killer in places like Vietnam. Far superior system vs Galil. George1 wrote: SVDM looks terrific!! Do we have any information about the SVDM? what is so much better in AK-400 comparing with other derivatives? It's a short stroke action, which renders the bolt carrier and bolt lighter as the rod is separate from bolt carrier. This means that the mass of the bolt and bolt carrier is not able to inflict as much "recoil" when it hits on the "buffer plate" that is fixed and spring loaded to the receiver. The short stroke action has a gas port, which is identical to the SVD, that allows for a better cleaner use of suppressors and also muzzle loaded grenades. Muzzle device is straight out of the AK12. Top cover is totally serrated on both ends. One lever on the rear receiver (like the Drag), but with a different mechanism and one springloaded, latched front serration like AN94. This means that it is possible to actually put a rail compatible sight system, all while also preserving the ability to have an Soviet legacy Unified mount system. Then there's the aperture rear sight, the freefloating had guard and generally the stiffer platform (1.5mm steel). Things that haven't changed, selector, ammunition, loading handle side. The new round is a 9 x 69mm so it is slightly larger in calibre to the .338 LM round which has the designation of 8.6 x 70mm, or 8.58 x 70mm.... even though its actual case measurement is given as 69.2mm. Would be interesting to see if they mass produced a ball version of the ammo for a heavy PKP with a semi auto rifle like the heavy AK12 model as the much larger round would allow both weapons to reach out and touch better at ranges in the 1,200m to 1,500m range with accuracy and lethality.